Today I show you how to create nice small gifts or home decoration for Halloween - Dough Pumpkins. Step 3. Add a little bit food colouring in each bowl. Step 4. Add water in each bowl. Dough up. Step 5. Your salt dough is ready so you can start creating your pumpkins. Step 6. Roll up couple orange balls. Diameter - 1-2 inches. Step 7. Flat them a little bit by pressing them by your finger on top. Step 8. Using toothpick create strips. Step 10. Cut out leaves and using toothpick create leaves fibers. Step 11. 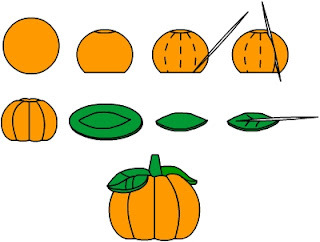 Put leaves on the top of pumpkin. Step 12. Bake in 350 degree F oven until pumpkins became hard. You can eat them but they are really hard and not tasty:-) Using this technique you can create other Halloween and not only Halloween gifts and decoration. So cool! I was wondering whether you could eat them and theen I read your last statement lol...someone will have to come up with an edible version asap! !